I want to share with you my new favorite worship tool. I purchased this veil from my friend Bobbi Muncy of All for His Glory Ministries last month. 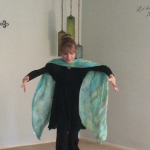 In this post, I share five things about this veil that make it my favorite, a video of a prophetic dance using this veil, and how you can purchase a custom veil, allow me to pay for shipping, and get access to a private study group I’m leading in March for free. I bought this veil on impulse. 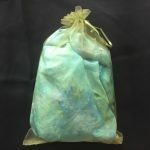 I’ve been drawn to the prophetic veils I’ve seen online, so when Bobbi posted that she was making and selling them for a limited time at a discount, I ordered one immediately. I actually didn’t even specify my color choice. I told her that I’m in a season in which I need healing and courage, so she asked if blues and greens speak to me. Not only does the color symbolism work, but those are my two favorite colors. 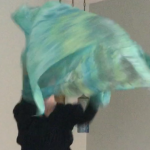 I’ve been using the veil in my morning modern dance workout/prayer time. 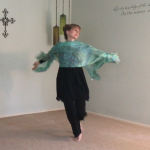 I just throw it on and move with it, sometimes just letting it flow over me as I do the steps of my morning routine and other times moving out into spontaneous dance and prayer. It is light and elegant, flowing so freely. It reminds me of the presence of the Spirit. 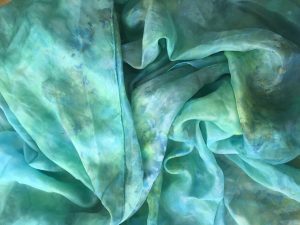 The fabric is silk, not synthetic. It breaths, flows, and feels smoother than other polyester scarves I have made. The colors contain symbolism: green and blue for healing. I know that it was created for me with this prayer in mind, so I experience ministry from Bobbi and from the Lord when I dance with it. It’s so easy to pack and take with me. Unlike my flags, which I love but can’t fit in my carry-on suitcase, I can even fit this veil in my purse. So, it’s easy to take along on a visit where I sense I might want to pray for someone or even have an unplanned chance to dance. There is something intimate about a veil that is unlike even flags. It drapes across the body, can be wrapped around me, and can be worn as a garment. It reminds me of how near the Lord is. 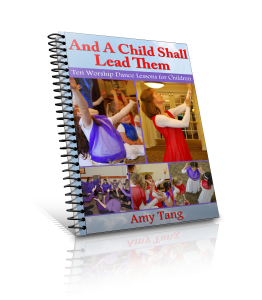 Here is a video in which I dance to a prophetic song by Laura Rhinehart called, “Isa’s Song” (available for purchase here) It has been speaking to me recently as I have danced to it. I appreciated this one so much that I wanted one in another color. I purchased my second veil, a red one, at Bobbi’s regular price. She named it “Cleansing Flood,” knowing I wanted to use it in prayer for strongholds to come down. 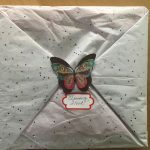 So, I’m sharing this with you for two reasons: First, because I think you will be blessed by these veils, whether you purchase one for yourself or just watch how they move in the video and pictures above. And second, because I want to share about Bobbi’s ministry. I think the Lord is in and on what she is doing, so I want to be part of it. So, I’m excited to be selling her veils here. 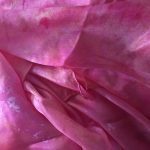 She creates silk flags, as well, which also can be easily packed up, because of their soft rods. I tried to buy the blue/green veil but it didn’t take my visa card #? I have clicked the buy now link a few times and it redirects me to the same page. Daisy, thank you so much for letting me know. I have corrected the problem. I apologize for the inconvenience to you.